The GYROTONIC® and GYROKINESIS® methods are complementary exercise methods that fall under one umbrella – the GYROTONIC EXPANSION SYSTEM®. Both methods were developed by Juliu Horvath. Horvath suffered a series of debilitating injuries during his dance career and began developing what is now known as the Gyrotonic and Gyrokinesis methods as a way to heal himself and regain his strength and agility. Gyrotonic exercises are performed on custom-designed Gyrotonic equipment, whereas Gyrokinesis exercises are performed on a mat and chair. Both exercise sequences are composed of spiraling, circular movements, which flow together seamlessly in rhythmic repetitions, with corresponding breath. Each movement flows into the next, allowing the joints to move through a natural range of motion without jarring or compression. These carefully crafted sequences create balance, efficiency, strength, and flexibility and are something anyone can do. 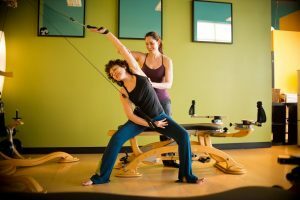 To view a schedule of upcoming Gyrotonic or Gyrokinesis Instructor Training Courses, CLICK HERE. I have learned so much about proper movement and core strengthening at this facility. Every instructor that I have met and worked with has been professional in their approach, yet seem to have very open hearts. I would highly recommend it to anyone seeking better health and core strength. – Dr. Steve M.
Stop in for a tour and to meet our expert trainers; enjoy a juice; shop our chemical free skincare and unique new clothing lines. MOVE Wellness Studios is conveniently located on Jackson Road in Ann Arbor, easily accessible from Chelsea, Dexter, Saline, Canton, Plymouth and Jackson.